Declawing is a series of bone amputations. Declawing is more accurately described by the term de-knuckling and is not merely the removal of the claws, as the term “declawing” implies. In humans, fingernails grow from the skin, but in animals that hunt prey, the claws grow from the bone; therefore, the last bone is amputated so the claw cannot re-grow. The last bone of each of the ten front toes of a cat’s paw is amputated. Also, the tendons, nerves, and ligaments that enable normal function and movement of the paw are severed. An analogous procedure applied to humans would be cutting off each finger at the last joint. A report published in the January 1, 2001 issue of the Journal of the American Veterinary Medical Association (JAVMA) by Yeon, et al., states that 33% of cats suffer at least one behavioral problem after declaw or tendonectomy surgery. Martinez, in Veterinary Medicine (June 1993), reports 11% lameness, 17% wound breakdown, and 10% nail re-growth post-operatively in cats having declaw surgery. The estimates of the prevalence of declawing vary considerably. It seems that 25%–43% of all cats in American homes are declawed. The reason for this high number is that many veterinarians actively market and recommend the procedure without disclosing the details of the procedure to their clients with cats. Others perform declawing unquestioningly. Many people with cats don’t understand that declawing is amputating the bones and think they are doing “all the right things” for their beloved animal. A survey of twenty Los Angeles area veterinary clinics, reported in the February-March 2003 issue of The Pet Press, found that 75% agreed to perform declawing without question and without any attempt to establish a medical, behavioral, or any other indication to justify the procedure. Not only is declaw-on-demand the norm, the staff at veterinary clinics commonly encourage clients, whose cats are scheduled for spaying or neutering, to “supersize” the procedure by adding declaw surgery. In DVM Best Practices, August 2002, veterinarian Kip Lemke illustrates typical levels of post-surgical pain using common surgical procedures. Declawing is associated with “severe pain,” compared against spaying (“moderate pain”) and neutering (“mild pain”). “Declawing is very painful – there’s no question about that…” says Dr. Katherine Houpt, Professor and Director of the Animal Behavior Clinic at Cornell University’s College of Veterinary Medicine. Carroll, et al., in JAVMA (July 15, 1998) report, “Typically, cats undergoing onychectomy (declawing) are not given any analgesics (pain medication) or are only given a single dose of analgesic before or after surgery…. There is a physiological cost associated with uncontrolled pain. Thus, provision of adequate analgesia…would be of benefit.” However, the investigators go on to report that veterinarians often have misconceptions regarding the degree and duration of pain following declawing, as well as the safety of analgesic use in cats, despite the abundance of published data documenting the efficacy of these drugs. The article also points out the challenges in assessing pain in cats. Cats instinctively hide signs of pain. The difficulties of clinically recognizing pain in cats is reported by a number of other authors, including Winkler ( J Am Anim Hosp Assoc 1997), Franks (JAVMA 2000), Cambridge (JAVMA 2000), and Gellasch (JAVMA 2002). It appears that under-medicating cats after declawing is the norm. A survey of over 1000 veterinarians by Wagner and Hellyer (JAVMA Dec. 1, 2002) found that 30% administered no pain medication after declaw surgery. For those animals receiving pain medication, there are potential problems. Some veterinarians have proposed the use of fentanyl patches. The patches, which are placed on the skin, contain a powerful narcotic. Their use in humans for post-operative pain was abandoned after several deaths occurred from accidental overdose. Yes, declawing deprives cats of their primary means of defense—their claws. Non-declawed cats will use their front paw claws to stave off a threat by swiping. Without these claws, declawed cats have to resort to biting to protect themselves. Many people mistakenly believe that a cat can protect itself by kicking with its back feet claws. What they do not realize is that in order to use the back claws, the cat has to be in the very vulnerable position of laying on its back, which is a disadvantage that can easily lead to losing the battle. Yeon, et al., (JAVMA 2001) found that 33% of cats suffer at least one behavioral problem after declaw or tendonectomy surgery. The study showed that 17.9% of cats had an increase in biting frequency or intensity and that 15.4% would not use a litter box. Bennett, et al., examining 25 declawed cats, reported that declawed cats were 18.5% more likely than non-declawed cat to bite and 15.6% more likely to avoid the litter box. In a retrospective phone survey, Patronek found that among 218 cats relinquished to a shelter, 52.4% of declawed cats versus 29.1% of non-declawed cats were reported to have inappropriate elimination. Landsberg reported that about 5% of cats developed either biting or litter box avoidance problems after declaw surgery. These figures were obtained by means of a written retrospective owner satisfaction questionnaire, approximately half of which were distributed by veterinarians other than the investigator. San Francisco Animal Care and Control — Some declawed cats become more nervous biters; others are known to become even more destructive to furniture than before the operation; and many cats stop using the litter box. East Bay SPCA — Deprived of their primary form of defense, declawed cats become nervous, fearful, and/or aggressive, often using their only remaining defense, their teeth. Some cats stop using their litter pan. This may be associated to the discomfort of scratching in the litter after the surgery. Palo Alto Humane Society — We have a no-declaw policy. These organizations and the individuals working there are obviously highly motivated to find each cat a home and do not wish to see the cat returned. They have found that declawed cats, with a disproportionate rate of biting and house soiling, have a relatively low adoption success rate. The American veterinary literature has contributed only six articles in the past 45 years that examine the link between declawing and behavior problems. The veterinarians are of a “don’t ask, don’t tell” mentality. It seems they don’t want to know what the true consequences of declawing are. The articles do find that there are behavior problems that are initiated by declawing, but they ignore how wide spread the problem truly is. “Shelter workers and rescue organizations have a better idea of what is going on with cats that have been declawed. These people are the ones who know that declawed cats are more likely to die. Veterinarians just don’t see the harm they are doing by declawing. If they knew they were sending animals to their deaths, they wouldn’t be declawing,” says Mikel Delgado, a cat behavior specialist and animal rescuer in Berkeley, California. A widely reported survey by Forgotten Felines and Friends of Caddo Parish in Louisiana found that 70% of cats surrendered to animal shelters for behavioral problems were declawed. Most of these animals are ultimately destroyed. This statistic is again corroborated by a survey of a Delaware animal shelter, reported in the magazine, Animal Times, which puts the number at 75%. 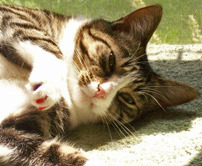 Cocheco Valley (New Hampshire) Humane Society has also reported a disproportionate number of relinquished cats with behavioral problems having been declawed, and is another of the many animal shelters in the US to adopt a no-declaw policy. No, people with compromised immune systems do NOT need to declaw their cats. In fact, declawing cats to prevent human illness is not recommended by the Center for Disease Control, the US Public Health Service, the National Institutes of Health, or infectious diseases experts. In his book, The Guide to Living with HIV Infection, John G. Bartlett, MD, Professor of Medicine and Infectious Diseases at the Johns Hopkins University School of Medicine, writes that common sense practices to avoid bites or scratches are sufficient and specifically states, “You need not declaw the cat.” Dr. Bartlett was the president of the Infectious Diseases Society of America in 1999 and has served as a consultant to the National Institutes of Health and as an editor for the New England Journal of Medicine. “Pet owners are far more likely to contract most zoonotic diseases (diseases that can be transmitted to humans from vertebrate animals) from contaminated food or drinking water than they are from their healthy companion animals,” says Suzanne Jenkins, VMD, MPH. Dr. Hansen’s clinic treats over 2500 HIV-positive individuals. Dr. Hansen said that he has seen only one or two cases of full-blown Bartonellosis in the 30 + years since HIV was first recognized. Bartonellosis is also known as Cat Scratch Disease (CSD); although, Dr. Hansen notes, current thinking is that Bartonella is not from scratches in most cases and more likely to be transmitted by fleas. Declawing is performed solely for the convenience of the person who has the animal. There is absolutely no benefit to the animal. Because declawing impairs the normal function of an animal’s paws, declawing may result in a bad outcome for the animal—physically and psychologically. (See above for behavior problems associated with declawing.) The repair surgery technique takes as many as six hours per paw. Rather than attempt a lengthy and risky reparative surgery technique, it is much more practical not to declaw in the first place, and thereby avoid inflicting potential adverse health consequences and psychological trauma that produces negative behavioral changes. The Paw Project has repaired the paws on about 75 declawed wild and exotic cats and that has resulted in significant improvement for the animals, but has not restored them to a normal condition. The repair surgery is expensive and can take up to six hours per paw, which significantly increases the inherent surgical risks. It has been performed on only about 10 domestic cats because their paws are small and the anatomy is often not recognizable for reconstruction. Yes, there is precedent for banning declawing. The Paw Project has successfully sponsored these American laws: Declawing became illegal in the West Hollywood, California in 2003—the first city in all of North America. Declawing has since been made illegal in seven other California cities: Santa Monica, Los Angeles, San Francisco, Beverly Hills, Burbank, Culver City and Berkeley. Declawing of wild and exotic cats is illegal throughout the State of California. The USDA, the governing body over animals that are exhibited, sold or bred, added to the Federal Animal Welfare Act a regulation that animals cannot be declawed or defanged as of August 2006. Regarding tolerance for declawing in veterinary practice, the United States is unusual compared with European countries. Declawing is illegal in many countries around the world, because it is regarded as inhumane. There is growing support of the European Council’s Convention for the Protection of Pet Animals, which prohibits declawing. To date, the Convention continues to gather signatories, and since its inception, countries including Switzerland, Sweden, Austria, Norway and Germany have enacted laws expressly prohibiting declawing. Further support for the enactment of laws prohibiting declawing has been expressed by the World Small Animal Veterinary Association, whose convention calling for an end to non-therapeutic surgeries, including declawing, ear cropping and tail docking, has been ratified by veterinary associations from Argentina, Australia, Austria, Belgium, Bosnia Herzegovina, British Columbia, Columbia, Croatia, Czech Republic, Denmark, Estonia, Finland, Greece, Hong Kong, Hungary, Ireland, Italy, Japan, Lithuania, Malaysia, Mexico, Netherlands, Norway, Panama, Poland, South Africa, Spain, Taiwan, United Kingdom and Uruguay. Attitudes concerning the relationship between humans and animals are changing worldwide. In 2002, Germany became the first European nation to vote to guarantee animal rights in its constitution when the members of the Bundestag voted to add “and the animals” to a clause that obliges the state to respect and protect the dignity of humans. Article 20a of the German Basic Law now reads: “The state takes responsibility for protecting the natural foundations of life and animals in the interest of future generations.” In January 2003, the European Union Parliament voted unanimously to ban the testing of cosmetics on animals as well as the sale and import of new cosmetics tested on animals. The farming of animals for fur was recently banned in England. Switzerland passed an amendment in 1992, recognizing animals as beings and not things. Mohandas Gandhi said, “The greatness of a nation and its moral progress can be judged by the way its animals are treated.” Although animals are still regarded as ‘property’ in the eyes of American law, changes in the attitude of the American public are evident. Thirty-seven states have recently passed laws making some forms of animal cruelty a crime. (New Jersey and Massachusetts have passed statewide laws prohibiting the devocalization, also known as debarking, of dogs.) Like declawing, this procedure is a non-therapeutic surgery that affords no benefit to the animal. A ban on declawing is consistent with this evolving attitude and would make California a leader and a model in the field of animal welfare. No, laser isn’t better. Neither is tendonectomy. Currently, the most common surgical procedures used to declaw cats are complete amputation using a blade, nail clippers or laser. Partial amputation, nail bed ablation, and tendonectomy (also called tenectomy) are also common declaw procedures. Some of these techniques were developed in an effort to compensate for the mutilating effects, extreme pain, or health complications known to be associated with the other techniques; however, each of these techniques has complicating factors or adverse health risks associated with them. Levy, et al. (1999), found that complications (bleeding, limping, swelling, infection) were generally worse in the laser onychectomy (declawing) group, compared against blade onychectomy in the first 2 days after surgery. Laser declawing can result in 4th Degree burns (burning of the bone). Jankowski also reported that 55% of the cats having tendonectomy were still able to scratch with their claws to some degree, and that 10% of the cat’s owners had the cats declawed after the tendonectomy procedure for this reason. It should be stressed that equating surgical sterilization to surgical declawing is an invalid comparison and a poor rationalization for performing the mutilating procedure of amputating a cat’s toes. A cat’s natural instinct to scratch serves both physical and psychological needs. Their claws are their primary, instinctive tools for defending themselves and capturing prey. They scratch to keep their nails in condition and to mark territory. Before domestication, cats satisfied these needs by clawing tree trunks. 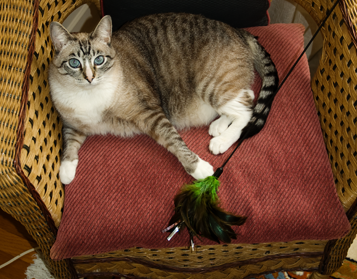 House cats can be trained to satisfy their desire to claw without damaging valuable property. Most cats can be trained to use a scratching post. Other options include the use of nail trimmers, sticky strips applied to furniture, climbing trees and scratching mats. Cats stretch their bodies and tone their muscles by digging their claws into something and pulling back against their own clawhold. Declawed cats are deprived of the means to defend themselves or flee from danger. Declawed cats have been injured or killed by other animals when they could not climb out of harm’s way or had impaired ability to protect themselves. Jimmy wearing Soft Paws cat nail caps. Soft Paws® and Soft Claws® are vinyl nail shields that are safe, non-toxic caps adhered to your cat’s natural nails. They protect your furniture from scratching damage without interfering with the cat’s natural ability to extend and retract its claws. After a month or so, the caps are shed with the natural growth of the cat’s nails. Items like Soft Paws® and scratching mats will protect your possessions and provide the necessary outlet for your cat to scratch. Remember, the time you invest in training your cat will be rewarded over a long and happy lifetime together. Reproduced by permission. Copyright 2001 © Jean Hofve, DVM – All Rights Reserved. Researchers have shown that in the immediate post-operative period, newly declawed cats shift their body weight backward onto the large central pad (the three-lobed pad on the palm) of the front feet and off the toes. This effect was significant even when strong pain medication was given, and remained apparent for the duration of the study (up to 40 hours after surgery). This altered gait may persist over time, and can cause stress on the leg joints and spine, and could lead to damage and arthritic changes in multiple joints. X ray images of declawed cats confirm this theory. Declawing that results in biting or litter box avoidance may result in the cat being dumped at a shelter or simply abandoned. If taken to shelters, such behaviors make them unadoptable, and they will be destroyed. Many cats are exiled to a life outdoors because of these unwanted behaviors, even though declawed cats should not be allowed outside—their ability to defend themselves, and to escape danger by climbing, is seriously impaired. They also risk injury or death by dogs, cars, coyotes, poison, and other hazards of outdoor life. There is always a small but real risk of death from any general anesthesia, as well as from hemorrhage or other surgical complications. Many veterinarians will say that they would rather declaw. A cat can be trained to use scratching posts to sharpen its claws without damaging furniture. Look at what the cat chooses to scratch on and duplicate it in your choice of scratching posts. If the cat chooses to scratch on the vertically oriented wooden legs of a table, get a wooden scratching post. It’s the same for carpet. Most cats like the corrugated cardboard scratching pads that are available at grocery stores or pet supply warehouses. Place a little catnip on the new post to entice the cat to use it. Reward the cat with praise, love and treats for scratching in the right place. A vertical scratching post should be at least 28-36″ (1 meter) high to allow the cat to stretch to its full height. Many cats prefer natural soft wood, such as a cedar or redwood plank, or posts covered with sisal rope. Some cats like to scratch on a horizontal surface; inexpensive cardboard scratchers are popular with these cats. Rubbing the surface with catnip, or using a catnip spray, may enhance the attractiveness of the post. For the more adventurous types, there are cat trees in dozens of sizes and colors, with features such as hidey-holes, lounging platforms, hanging toys, and other creative amenities. Many people do not even know that they should provide a scratching post for their cats. Because scratching is a deeply ingrained instinct in cats, if there is no appropriate spot, they will be forced to substitute furniture or other objects. Regular nail trimming should help prevent damage to furniture. The cat’s claws are clear, so it is easy to avoid accidentally trimming too deep and getting the quick. Using surgery to prevent or correct a behavioral problem went out of fashion with lobotomy. There are many other options as well, such as clear, sticky strips to apply to the furniture, and other deterrents, as well as a multitude of climbing trees, mats, and other distractions that will protect your possessions. 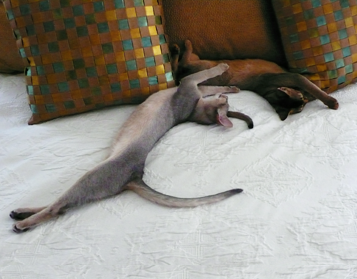 Adequate exercise, especially interactive play sessions, will also help channel the cat’s energy. For aggressive scratching, conscientious nail-trimming or soft vinyl caps for the claws, Soft Paws®, are a good beginning. Remember, never play or roughhouse with your kitten or cat using your bare hands. You don’t want the cat to get the idea that biting or scratching human skin is okay. And while it’s fun to watch the kitten attack your wiggling toes under a blanket, when the 15 pound cat with 1/2 inch-long canine teeth does it, it’s not nearly as amusing. One veterinarian in the Los Angeles described declawing as his “Bread and Butter.” However, top veterinary behaviorists and the American Veterinary Medical Association agree that declawing should not be considered as routine or preventive procedure. Your veterinarian has an obligation to educate you as to the nature of the procedure, the risks of anesthesia and surgery, and the potential for complications. Some veterinarians in the U.S. and Canada have become accustomed to performing the declawing procedure without thinking about – or recognizing – the consequences. Some veterinarians even recommend routinely declawing kittens at the same time they are spayed or neutered, whether or not they have developed destructive scratching behavior.